Western readers are of course at a disadvantage reading these op eds because how is a non-Egyptian to know if they are telling the truth? On the one hand, one would like to believe the Brotherhood really does want peace, tolerance and democracy. On other hand, if they don't, it is obviously in their interest to lie. One way to determine if the Brotherhood's claims can be trusted is to test one important assertion whose truth can be easily evaluated. If that claim is true, the rest may be true. If that claim is false, how can one trust any of the rest? "Our principles, clearly stated since the inception of the movement in 1928, affirm an unequivocal position against violence." "The verses of the Qur'an and the Sunnah summon people in general (with the most eloquent expression and the clearest exposition) to jihad, to warfare, to the armed forces, and all means of land and sea fighting." "The ummah that knows how to die a noble and honourable death is granted an exalted life in this world and eternal felicity in the next. Degradation and dishonour are the results of the love of this world and the fear of death. Therefore prepare for jihad and be the lovers of death. Life itself shall come searching after you." It is worth noting that Hamas is the official Palestinian branch of the Muslim Brotherhood, and that the Palestinian Authority is controlled by Fatah, organized by subordinates of Hajj Amin al Husseini, the late leader of the Muslim Brotherhood in Palestine. People have for some time now ridiculed this but today these same people acknowledge that preparation for war is the surest way to peace! Allah did not ordain jihad for the Muslims so that it may be used as a tool of oppression or tyranny or so that it may be used by some to further their personal gains. Rather jihad is used to safeguard the mission of spreading Islam. This would guarantee peace and the means of implementing the Supreme Message. In other words, war is justified until everyone in the world realizes the truth of the Qur'an, and indeed it is precisely through its victory in jihad that the Qur'an's alleged truth "becomes manifest to them." Islam is the destination and jihad is the motor force by which mankind approaches the destination. Clearly, Al-Banna does not advocate "non-violence." And clearly, El-Errian is familiar with Al-Banna's works, which are required reading for all members of the Muslim Brotherhood, not to mention their top leaders. Now, Muslim Brotherhood leader El-Errian could have written that the Brotherhood was founded and led (from 1928 until his death in 1949) by an Imam who not only saw holy war as acceptable, but who saw it as the most important aspect of Muslim life; that, yes, the Brotherhood had been teaching his treatise "On Jihad" for many decades, but that now the Brotherhood has rejected the Imam's teaching. – then how can anyone trust his other claims about believing in democracy, not wishing to force Islamism on Egypt, and so on? "committed to joining the national effort toward reform and progress." (C) Brian Rea/The New York Times, 2011. Reproduced here for educational purposes. For Fair Use Only. Soothing, n'est-ce pas? 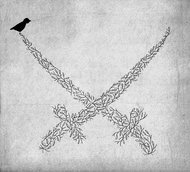 The Brotherhood believes in soft jihad; swords into ploughshares, or, more accurately, into vegetation; etc. 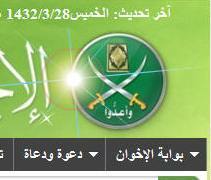 (C) Muslim Brotherhood, 2011. Reproduced here for educational purposes. For Fair Use Only. No cute bird. No New Agey vegetation. Crossed steel and a Koran. Allah's word, implemented via the two types of jihad. In other words, the ideas of Hassan al-Banna. It is perfectly obvious why El-Errian lies, is it not? When the U.S. government (not to mention the governments of Australia, the UK, Germany, and so on) are furiously pushing one into power, it is awkward to inform Western citizens that one believes in violence to establish universal Islamic rule. Does the butcher confide his plans to the meat cow? But what explains the behavior of the New York Times?